The scope of ultrasound-guided regional anesthesia has grown significantly in recent years, and is now a key technique for pain control. Dr. Jens Döffert, consultant anesthetist at Kreisklinikum Calw in Germany, discusses the advances in regional anesthesia in his book, “Sonography in Anesthesia: Interventional Procedures in Adults and Children (2nd Edition)," written in association with his colleague Dr. Ralf Hillmann from Stuttgart. Dr. Döffert first used ultrasound-guided pain relief in his early days as a senior physician in a spinal center in Langensteinbach. In 2006, together with Dr. Hillmann, he was one of the first anesthetists to qualify as an instructor for the German Association of Ultrasound in Medicine (DEGUM). Döffert has continued to focus on regional anesthesia throughout his career, as the chief physician in a dedicated orthopedic unit in Bad Wildbad and, since July 2016, on a larger scale in Calw. Although a relatively small district general hospital with just under 200 beds, Calw has a comprehensive orthopedic service, including specialist spinal surgery. Döffert works in close association with Calw’s spinal surgery team, focusing primarily on treating orthopedic and trauma patients. “Back pain is a common problem. It could be due to prolapsed discs, narrowing of the spinal canal, or non-specific pain. Ultrasound is often the least inconvenient and most comfortable way for me to image a patient. For x-rays, you have to lie in a specific position on a hard table, often in a cold room, which is even more uncomfortable and painful when you are suffering from back pain. Many people are also apprehensive of lying in a CT scanner. 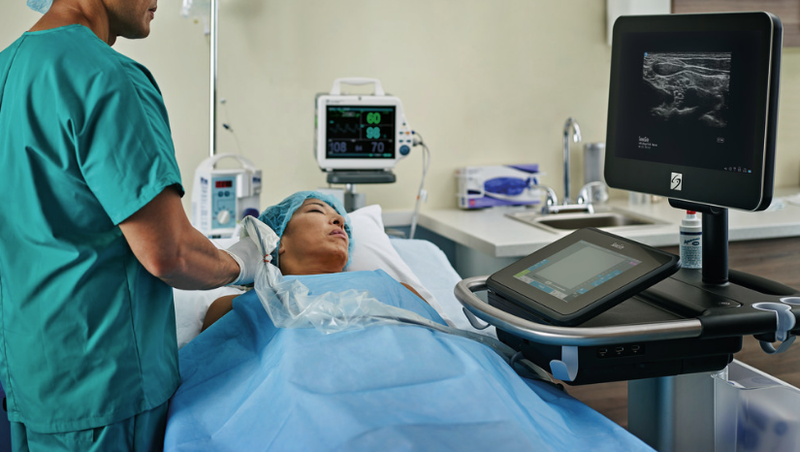 With ultrasound, I can scan patients in their hospital beds, and they can position themselves however they feel most comfortable, as long as I can access the area of interest with the transducer." “I can inject sacroiliac joints, nerve roots and facet joints in the lumbar and cervical areas of the spine, and even perform stellate ganglion blocks. I can also treat problems of the piriform muscle, and perform peripheral nerve blocks where necessary. There have been many developments in ultrasound-guided regional anesthesia in the past 10 years, most notably the rise in using ultrasound to guide minimally invasive pain control, which is now featured in the second edition. We have added several new access routes, including transversus abdominis plane blocks, and some instances of a change in recommended technique, for example supraclavicular and interscalene access, where we now approach the plexus laterally to avoid anesthetizing the phrenic nerve. The beauty of ultrasound guidance for these blocks, and any pain relief, is that you scan the target area, see where you want to go and mark it, and the injection itself takes only a minute or two. It is really fast because the structures are clearly shown, and you are successful in the first attempt much more frequently than before, which is so important for patients and anesthetists alike." St. Joseph’s Emergency Department launched the ALTOSM (ALTernatives to Opioids) Program in January 2016 as they realized that prescription opiates are fueling the addiction epidemic. The program uses targeted non-opioid medications, trigger point injections, nitrous oxide, ultrasound-guided nerve blocks, and even meditation, to help ease pain in patients with acute injuries like broken bones, and ongoing issues like migraine headaches.